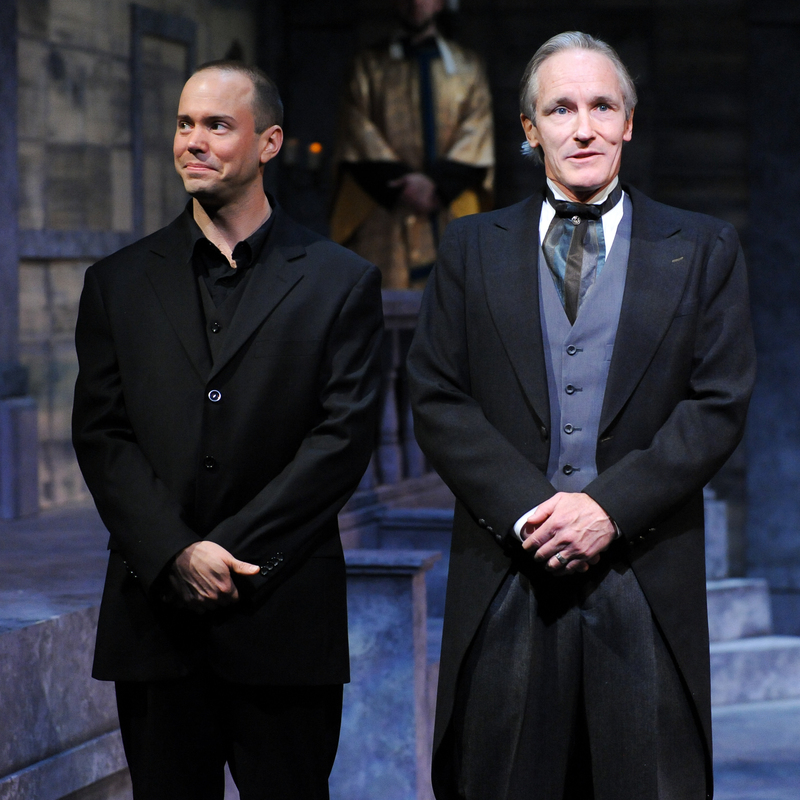 Brent Vimtrup as Hamlet and Bruce Cromer as Claudius in CSC’s 2014 production of Shakespeare’s “Hamlet” January 10- February 8, 2014, directed by Brian Isaac Phillips. Performances are located at CSC’s Theatre , 719 Race Street in downtown Cincinnati. Tickets are $22-35 and are available online at cincyshakes.com or by calling the box office 513.381.2273. Photo by Rich Sofranko. 1. The Blue Wisp has good food and good music! I had a pre-show meal with my friend Connie (she had tickets to the symphony so was unable to join me for “Hamlet”) and we were impressed with this jazz club and restaurant. The musician was a little loud at first, but his blues interpretations of some rock songs got me in the groove. I found myself moving a little in my seat. As far as food goes, the chicken tenders appetizer was well worth the (half-)price I paid. Connie had the Cuban sandwich and a side salad and I had a single patty burger with swiss cheese, bacon, and BBQ sauce on the side. The best part: I crossed the street and was in the lobby of CSC. 2. Wright State is producing great new talent. Zach Schute, a 2012 graduate, is now in his second season with CSC. Justin King, a 2013 grad, is in his debut season. Both of them were really good in their supporting roles. And of course it doesn’t hurt that Bruce Cromer has been instrumental in teaching both of them how to act there. 3. I have renewed empathy for people who sit behind me in theaters. I was seated (for free – thanks to CSC, so I’m absolutely not complaining!) behind a giant column that blocked part my view on some of the action happening in front of the stage on the side and the gentleman in front of me was tall and his head was also in my way for some of the show. I worked it out, but I will try to be more aware of my height and the poor people behind me in the future. 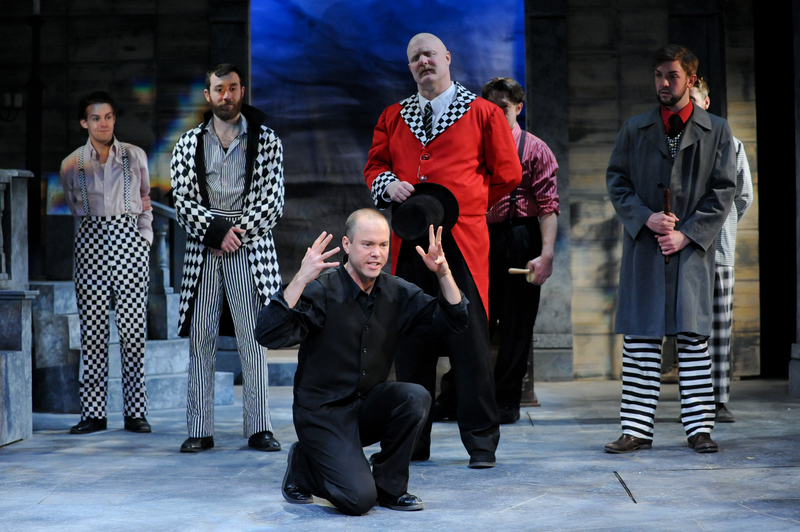 Brent Vimtrup as Hamlet pictured with the players in CSC’s 2014 production of Shakespeare’s “Hamlet” January 10- February 8, 2014, directed by Brian Isaac Phillips. Performances are located at CSC’s Theatre , 719 Race Street in downtown Cincinnati. Tickets are $22-35 and are available online at cincyshakes.com or by calling the box office 513.381.2273. Photo by Rich Sofranko. 4. Great actors are great actors whether they are performing American classics, Dickens, or contemporary comedy, and Elizabethan masterpieces. Bruce Cromer, who I just saw own the role of Ebenezer Scrooge at the Playhouse in the Park, did a tremendous job as “Claudius”. I understood who the character was because of his performance in spite of my ignorance (and dislike) of Shakespearian language. Sara Clark (“Ophelia”) was just in “Every Christmas Story Ever Told” and was brilliant in both that show and this dramatic role. Same with Brent Vimtrump, who was just marvelous as John Proctor in the Crucible. His chameleon like ability to transform into a cocky New England farmer and the maniacal genius of Hamlet is awe-inspiring. Great actors are great actors. Period. 5. I need to see more classic theatre. “Hamlet” is regarded by many as the “greatest play ever written.” I don’t know that I’ll ever be a William Shakespeare fan-boy but I’m going to keep going and learning and embracing the classics — especially if they are performed with as much talent and skill as the company from Cincinnati Shakespeare. A few other random thoughts: Sherman Fracher as “Gertrude” was fun to watch. The entire cast was great, but there is something about her energy that drew me in. The tech (lighting, sound design, costumes) all came together seamlessly to tell this classic story in a way that even without fully understanding the dialogue I was able to follow the plot. I am vaguely familiar with “Hamlet,” though I don’t think I’ve ever read it so I needed help; the company, the tech folks, everyone worked together to help folks like me figure it out without Cliff’s notes in front of me. I also appreciate the energy at CSC. There are obviously a lot of regulars (season subscribers) especially on opening night. Everyone – young and old – seemed to be having a great time. It was certainly an enjoyable night at the theatre and I’m excited to do it again and soon! “Hamlet” runs until February 8th . Tickets are going fast and are available here or by calling the Box Office at 381-BARD. Up next for CSC is the “Rosencrantz and Guilderstern Are Dead” featuring the same cast and set as “Hamlet.” It should be hilarious!